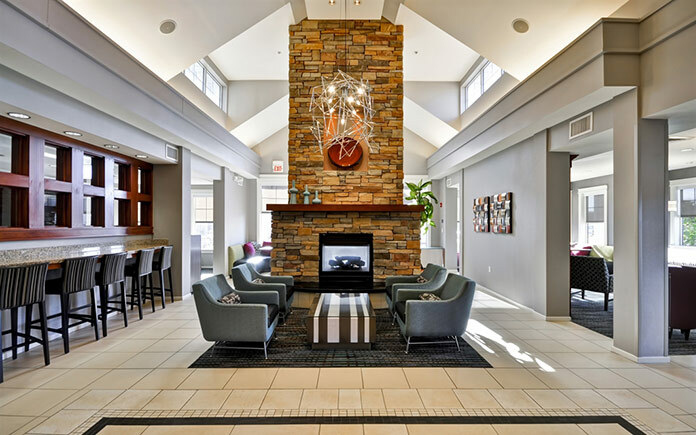 The 108-room Residence Inn St. Louis O’Fallon located at 101 Progress Point Court has completed a major renovation in its guest rooms and public spaces. The property hosted a ribbon cutting and grand re-opening event on Thursday, December 15 with members from the O’Fallon Chamber of Commerce and local businesses in attendance. The scope of the two-million dollar renovation includes new bedding, carpet, floor tile, curtains, paint, wall vinyl, artwork and all new soft seating furniture. Thoughtfully designed with geometric patterns, the new modern furnishings accommodate guests’ desires to stay connected and comfortable during their stay. The redesigned all-suite hotel features studio, one-bedroom and two-bedroom suites. Designed to accommodate guests staying five nights or more, each suite includes the modern comforts of home: a fully-equipped kitchen with coffeemaker, microwave oven and full-sized appliances. Rooms also include features that provide guests the ability to work while on the road including a well-lit work desk, ergonomic chair and complimentary high-speed wired and wireless Internet access. Other services the hotel offers include shuttle service to local area businesses and restaurants, and a complimentary hot breakfast buffet with convenient to-go offerings. On select weeknights guests are invited to attend “The Mix,” a social event featuring complimentary appetizers and drinks.